Her stories may be literal one-liners: the entirety of "Bloomington" reads, "Now that I have been here for a little while, I can say with confidence that I have never been here before." Or they may be lengthier investigations of the havoc wreaked by the most mundane disruptions to routine: in "A Small Story About a Small Box of Chocolates," a professor receives a gift of thirty-two small chocolates and is paralyzed by the multitude of options she imagines for their consumption. The stories may appear in the form of letters of complaint; they may be extracted from Flaubert's correspondence; or they may be inspired by the author's own dreams, or the dreams of friends. 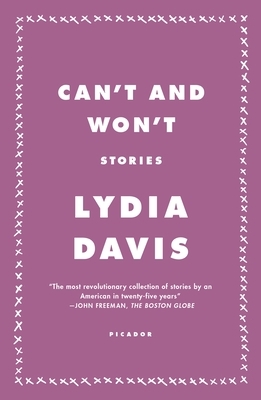 What does not vary throughout Can't and Won't, Lydia Davis's fifth collection of stories, is the power of her finely honed prose. Davis is sharply observant; she is wry or witty or poignant. Above all, she is refreshing. Davis writes with bracing candor and sly humor about the quotidian, revealing the mysterious, the foreign, the alienating, and the pleasurable within the predictable patterns of daily life.